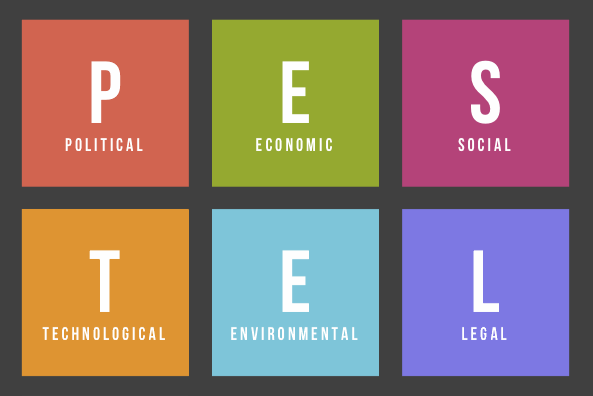 PEST analysis ('Political, Economic, Social and Technological analysis''') describes a framework of macro-environmental factors used in the environmental scanning component of strategic management. It is a useful strategic tool for understanding market growth or decline, business position, potential and direction for operations. 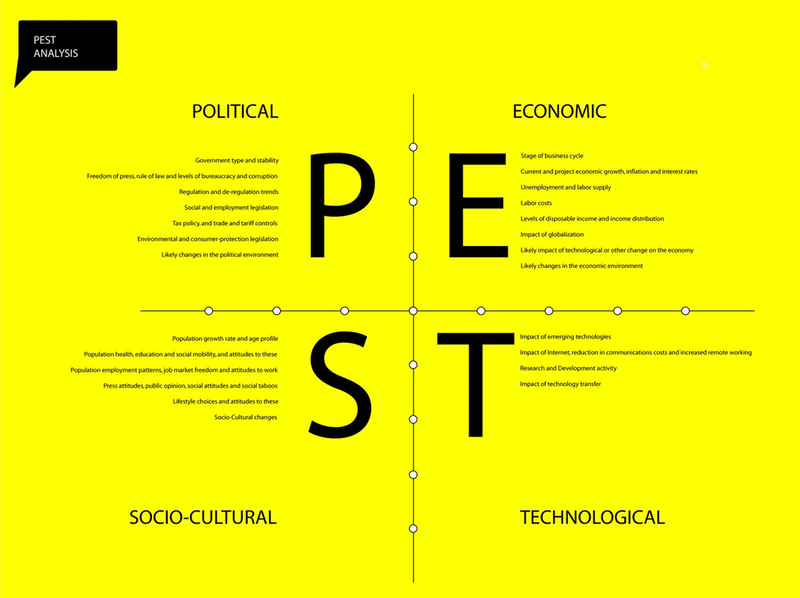 PEST is an acronym for Political, Economic, Social and Technological. This analysis is used to assess these four external factors in relation to your business situation. It helps you to spot business or personal opportunities, and it gives you advanced warning of significant threats. It reveals the direction of change within your business environment. This helps you shape what you're doing, so that you work with change, rather than against it. It helps you avoid starting projects that are likely to fail, for reasons beyond your control. It can help you break free of unconscious assumptions when you enter a new country, region, or market; because it helps you develop an objective view of this new environment. Political factors are basically to what degree the government intervenes in the economy. Political factors may also include goods and services which the government wants to provide or be provided (merit goods) and those that the government does not want to be provided (demerit goods or merit bads). Furthermore, governments have great influence on the health, education, and infrastructure of a nation. Depending on the country, how well developed are property rights and the rule of law, and how widespread are corruption and organized crime? How are these situations likely to change, and how is this likely to affect you? How will business regulation, along with any planned changes to it, affect your business? And is there a trend towards regulation or deregulation? How does government approach corporate policy, corporate social responsibility, environmental issues, and customer protection legislation? What impact does this have, and is it likely to change? What is the likely timescale of proposed legislative changes? Are there any other political factors that are likely to change? These factors have major impacts on how businesses operate and make decisions. For example, interest rates affect a firm's cost of capital and therefore to what extent a business grows and expands. Exchange rates affect the costs of exporting goods and the supply and price of imported goods in an economy. How stable is the current economy? Is it growing, stagnating, or declining? Are key exchange rates stable, or do they tend to vary significantly? Are customers' levels of disposable income rising or falling? How is this likely to change in the next few years? What is the unemployment rate? Will it be easy to build a skilled workforce? Or will it be expensive to hire skilled labor? Do consumers and businesses have easy access to credit? If not, how will this affect your organization? How is globalization affecting the economic environment? Are there any other economic factors that you should consider? Trends in social factors affect the demand for a company's products and how that company operates. For example, an aging population may imply a smaller and less-willing workforce (thus increasing the cost of labor). Furthermore, companies may change various management strategies to adapt to these social trends (such as recruiting older workers). What is the population's growth rate and age profile? How is this likely to change? Are generational shifts in attitude likely to affect what you're doing? What are your society's levels of health, education, and social mobility? How are these changing, and what impact does this have? What employment patterns, job market trends, and attitudes toward work can you observe? Are these different for different age groups? What social attitudes and social taboos could affect your business? Have there been recent socio-cultural changes that might affect this? Are any other socio-cultural factors likely to drive change for your business? They can determine barriers to entry, minimum efficient production level and influence outsourcing decisions. Furthermore, technological shifts can affect costs, quality, and lead to innovation. Do any of your competitors have access to new technologies that could redefine their products? In which areas do governments and educational institutions focus their research? Is there anything you can do to take advantage of this? How have infrastructure changes affected work patterns (for example, levels of remote working)? Are there existing technological hubs that you could work with or learn from? Are there any other technological factors that you should consider? Ecological aspects such as weather, climate, and climate change, which may especially affect industries such as tourism, farming, and insurance. Furthermore, growing awareness of the potential impacts of climate change is affecting how companies operate and the products they offer, both creating new markets and diminishing or destroying existing ones. These factors can affect how a company operates, its costs, and the demand for its products.